• Fast and sensitive. Use of 40 μL sample. Linear detection range 3 to 300 μM lactulose in 96-well plate assay. • Convenient. The procedure involves adding a single working reagent, and reading the absorbance after 60 minutes. Room temperature assay. No 37°C heater is needed. • High-throughput. "Add-mix-read" type assay. Can be readily automated as a high-throughput 96-well plate assay for thousands of samples per day. • LACTULOSE (C12H22O11) is a synthetic sugar that is non-digestible by the gut. It is used to treat constipation and hyperammonemia. It may also be used for intestinal permeability test for leaky gut. Lactulose can be found in milk-based products. Raw milk normally contains extremely low or no level of lactulose. However, the lactulose level in milk will increase after heat-treated. BioAssay Systems lactulose assay kit is based on β-galactosidase catalyzed oxidation of lactulose, which generates D-fructose and D-galactose. The generated D-fructose reacts with the specific reagent to form a colored product whose color intensity, measured at 565 nm, is proportional to the lactulose concentration in the sample. 1. I don’t have the correct wavelength filter, will the assay still work? 2. I don’t have a 96-well plate, will the assay kit work in a 384 well plate, cuvette, etc? 3. 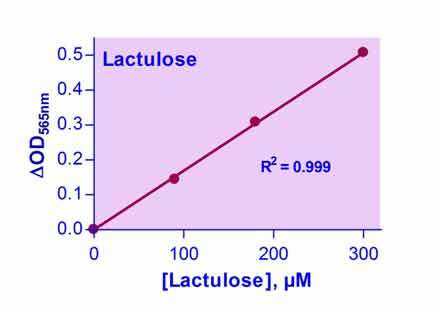 Is the lactulose assay kit suitable for biological samples such as blood, urine, etc.? The assay kit should be suitable for urine samples. Blood samples as well as other biological samples may contain lactulose under the detection limit (3 μM); however, they should be detectable as long as the concentration is > 3 μM. 4. How do I prepare the solid & liquid samples? Liquid samples can be assayed directly. Check the pH of the sample and neutralize if necessary. Milk samples should be cleared by mixing 600 uL milk with 100 uL 6 N HCl. Centrifuge 5-10 min at 14,000 rpm. Transfer 300 uL supernatant into a clean tube and neutralize with 50 uL 6 N NaOH. The neutralized supernatant is ready for assay (dilution factor n = 1.36). Urine samples can be assayed direactly without dilution. Solid samples: chop or grind solid samples. Weigh 200 mg sample and homogenize (vortex or handheld homogenizer) in 600 μL H2O or 1M perchloric acid. Centrifuge homogenate at 14,000g for 5-10 min. Transfer the clear supernatant into a clean tube. Neutralize if necessary. It is prudent to run a pilot test of the sample at different dilutions. Choose a dilution with the readings in the detection range of the standard curve for assays. Most samples can be stored at -80°C if not assayed immediately. Yes, unused reagents can be stored according to the assay protocol. Repeated freeze/thaw cycles of reagents should be avoided.